Grieving adolescents are often left to fend for themselves or are offered support from counselors outside their community immediately after an event. Such support may be unwelcome, particularly by adolescents. Grief and loss are often themes in young adult literature. From classic novels such as Old Yeller to more current popular books and films such as The Fault in Our Stars and even the Hunger Games series, death and grief are front and center. Sometimes, as in the horrific Overland Park, Kansas shooting on Sunday, death and grief escape the adolescent's fictional world, becoming a real-life experience. Yet as a group, adolescents are often neglected or disenfranchised grievers. Excellent resources exist for grieving children, and grief support groups are generally developed with adults in mind. Unfortunately, grieving adolescents are often left to fend for themselves or are offered support from counselors outside their community immediately after an event. Such support may be unwelcome, particularly by adolescents. Consequently, teachers and others who routinely work with adolescents are in a position to not only recognize grieving students, but also to grapple with how best to accommodate students dealing with the pain and ongoing journey of grief. Adolescents are likely to experience losses that are sudden, unexpected, and traumatic. 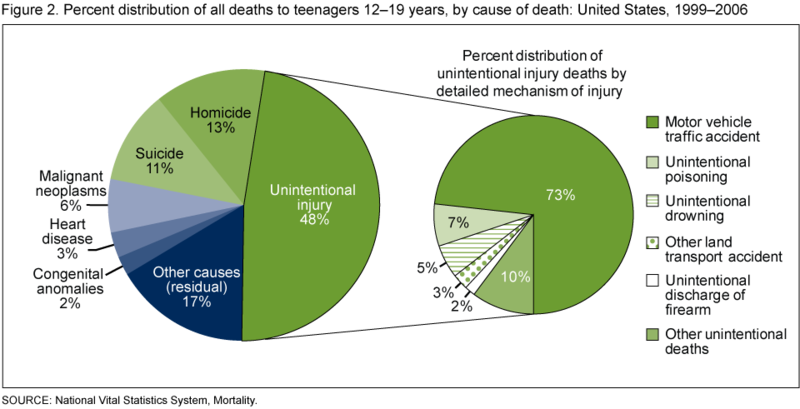 The three leading causes of death in adolescence are unintentional injury (accidents), suicide, and homicide, according to the National Vital Statistics System of the Centers for Disease Control and Prevention, which reports that 72 percent of deaths between the ages of 12 and 19 occur for these reasons in the United States. So at a time when adolescents most strongly base their own identity on their peers, a loss of a peer is likely to be due to a traumatic event. Even other losses, such as the death of a parent or sibling, may feel unexpected even if from natural causes. Adolescents may need support in processing the complex emotions often associated with grief after sudden death, including a sense that the world is less than safe or predictable. Such losses may affect an entire school community, and the school should have a strategy in place to communicate and address traumatic deaths. Schools should have plans in place to support surviving students and policies established around notification and memorializing students who die. Adolescents can be isolated in their grief. As adolescents become more independent, they also may become less comfortable in seeking support from parents or other adults. The young child who once curled up in a parent's lap when upset may now be the adolescent who slams his or her bedroom door. In a middle school and high school setting, it may be more challenging for teachers and counselors to effectively assess whether a student is having a difficult time coping with a loss, or to even know that a loss has occurred in a student's life. Take the time to have a private conversation with him or her and find out. It may be useful to ease up on homework and exam expectations for a period of time and let other school personnel know about the loss. Adolescent egocentricity stresses the need for normalcy. Adolescents often believe the world is constantly looking at them and judging them. The adolescent then places great value on fitting in -- emphasizing a sense of strength and normalcy. The grieving adolescent is likely to keep grief at a distance to not be seen by peers as "the kid whose father died." Peer support groups or teen grief camps can be safe places for grieving teens to feel "normal" with other teens who have had the same experience. A number of terrific grief camps exist, and may local hospices have their own programs geared towards adolescents. Two camps with national networks are Comfort Zone Camps and Camp Erin. Adolescents are more likely to turn to the Internet and social media as they cope with loss. Adolescents are digital natives -- at home with technology, while most adults are digital immigrants. Adolescents go online for information and utilize a variety of forms of social media for support and opportunities to memorialize. While good information and social support can be found online, adolescents also need to be reminded that the information may not be accurate, and that the anonymity of the Internet may expose them to cruel comments or even online predators. Direct adolescents to safe places to share their grief, such as Hellogrief.org, monitored for safety by Comfort Zone Camps. Adolescence is often a time of spiritual questioning. Adolescents know the beliefs that they have been taught in childhood. Part of the development of identity during adolescence is asking, "What is it that I believe?" In a time of spiritual questioning, grieving adolescents may not be able to rely on their faith as strongly as they did as children, or as strongly as they may again in adulthood. Adults supporting grieving teens need to encourage them to explore their spirituality and grief in an open and honest way. Adolescent grief may be masked by other behaviors. Acting out behaviors, substance abuse, and eating disorders may all be ways that the adolescent copes with loss and seeks support. Adults who work with adolescents, including teachers, counselors, and health care professionals, need to learn to recognize these signs and refer if necessary. In recent years, we have moved away from looking at grief as a process of universal stages, understanding instead the very personal pathways people experience in their journey with grief. An individual's grief is as unique as a fingerprint or snowflake. While there are differences in the ways that adolescents may express and experience grief, two things remain the same: Significant losses of the individuals with whom adolescents form attachments will cause grief, and most important, an adolescent -- as any grieving person -- needs understanding and support while coping with loss in his or her individual way.